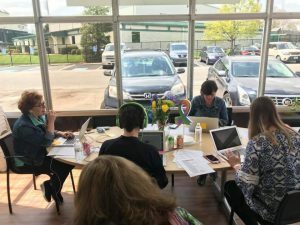 A glimpse at the 127 stories we collected at our first STORY-thon Wednesday, April 18th. 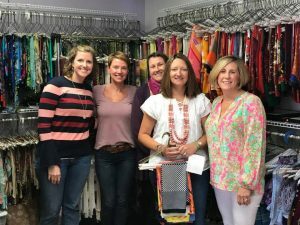 As you know, Hope Scarves shares scarves & stories with people facing cancer. Our program is growing quickly as we send about 50 Hope Scarves a week. Which means we have to collect many, many scarves & stories to replenish our collection. Survivor stories – the very heart of our work and what makes our program so special, have proven challenging to collect. And, for good reason. It’s hard to open up & remember a difficult time. 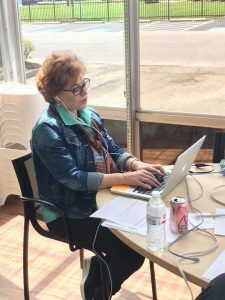 Many women are worried their story won’t be “good enough” and find the idea of writing such personal words intimidating. 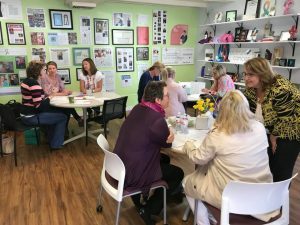 So, we are trying new ways to collect stories and make telling your story to Hope Scarves a meaningful, healing experience, as it is intended to be. We hope that by sharing her story each woman feels a sense of release & strength in knowing her words will lift someone else up. The STORY-thon was our first step in that direction. By creating this celebration of stories we set out to break down the barriers to storytelling and help women connect and share. 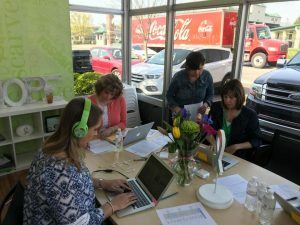 Our goal was to collect 100 survivor stories in one day through website, phone calls and walk-ins to our studio. What happened was so much more. We joined Louisville Mayor Greg Fischer’s Give a Day Week of Service. 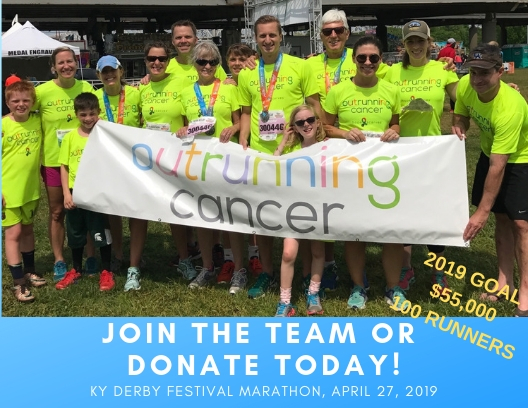 Promoting that anyone who has faced cancer could volunteer their story as a way to get involved with his push for community service. 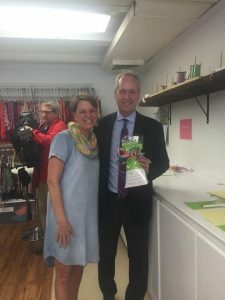 Mayor Greg Fischer stopped by to learn about our creative social entrepreneurship efforts. We even put him to work with this week’s scarf mailing. He picked out & wrapped the scarf we sent to Sue in Ohio. Of course, camera crews followed and we were on three tv stations as a result! Volunteers worked our “call center” from 10am-5pm. 4 phones were busy continuously as we called survivors and listened to their stories. It was remarkable. Survivors were appreciative to have the chance to tell their stories to caring volunteers. For many it is just easier to have a conversation than to sit down and put it on paper. Our volunteers were moved by the stories. Some were filled with laughter. Others, tears. One volunteer, Melissa Swan, a beloved Louisville news anchor, spoke with a bubbly young woman facing breast cancer. 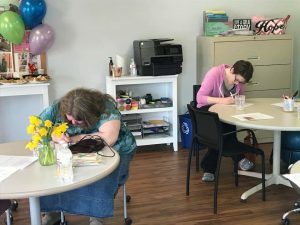 By all accounts you would think the conversation was going to follow the presumed path of diagnosis, treatment, fear, but then remission and relief, put it behind me, etc… However, this young woman shared that she is now in palliative care. She has taken a break from treatment for brain metastasis because the side effects are debilitating. And she just wants to live a little while without pain. Melissa sat in shock as she listened to her story. Smiling and asking caring questions with the poise of a news anchor… the conversation sounded like old friends. They talked well beyond their scheduled “time slot.” When Melissa hung up the tears flowed. I have a feeling the same was true on the other end of the line. Connection, storytelling, love. Our stories connect us. Help us find common ground and bring us strength. At the end of the day I sat down, exhausted, in our empty studio. Overwhelmed with gratitude for all the people who made the day a success. I sat quietly there, alone. I could feel the love and laughter hanging in the air. I felt the experiences and wisdom of the storytellers. I felt the compassion of the volunteers who listened. I felt the strength that comes with connection. In the end, that’s what we all seek – isn’t it? To feel loved and connected. Cancer is isolating. Terrifying. We aren’t able to take away the pain and fear. But, if we create a bit of hope and connection by capturing stories and sharing them with others – we might possibly make one moment, one day, lighter. I know we did today. If you’d like to share your survivor story with Hope Scarves please click here! We each have a story to tell. Our experiences are worthy of being preserved. The lessons we learn are valuable to others who walk a similar path. And, in telling, we heal. Hope Scarves has collected and shared nearly 1,000 STORIES with people facing cancer. Each Hope Scarf we send comes with a survivor STORY, scarf tying instructions and information about our sisterhood of the traveling scarves. We send about 50 Hope Scarves a week around the world- through personal requests, gift requests and our partnership program where Hope Scarves are shared through hospitals and cancer support organizations. In order to keep up with our growth we have to collect hundreds of scarves & STORIES monthly. 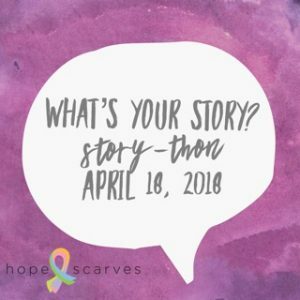 To focus on the STORY side of the Hope Scarf, we are hosting our first STORY-thon on Wednesday, April 18th from 10am-4pm EST. This creative event is in partnership with Louisville Mayor Greg Fischer’s Week of Service. And, we need your help! If you are a cancer survivor and haven’t shared your story with Hope Scarves yet, won’t you please consider taking 10-15 minutes to do so on Wednesday? We know telling your cancer story is hard. So we’ve taken thoughtful steps to make participating in the STORY-thon easier. Sign up for a volunteer to call you for a 10-15 minute interview. If you have a scarf to donate please let us know when you share your story. If you know someone who has faced cancer please spread the word about the STORY-thon and encourage them to share. The STORY part of our mission is what makes each Hope Scarf so special. Knowing someone else has faced cancer and is encouraging you creates a special connection between those who donate or receive a Hope Scarf. 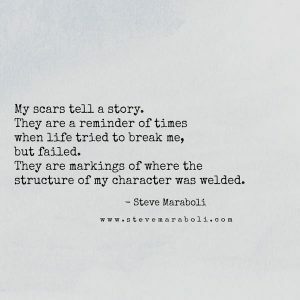 For me, writing and telling stories is therapy. I love to get my emotions out through words. But, I realize this isn’t the case for everyone. That’s why we created the STORY-thon… a comforting and convenient way to help you tell your cancer survivor story. If cancer has rocked your world (as it has mine) please consider sharing your story with Hope Scarves on Wednesday. A celebration of stories and those who tell them!